A stoneware bowl of conical shape, the deeply rounded sides supported on a low foot and terminating in a straight rim. 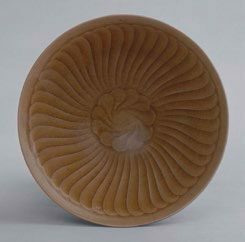 The interior of the bowl is carved with a pattern that imitates overlapping chrysanthemum petals with a medallion in the centre. The exterior is similarly carved with chrysanthemum petals radiating from the foot towards the rim. 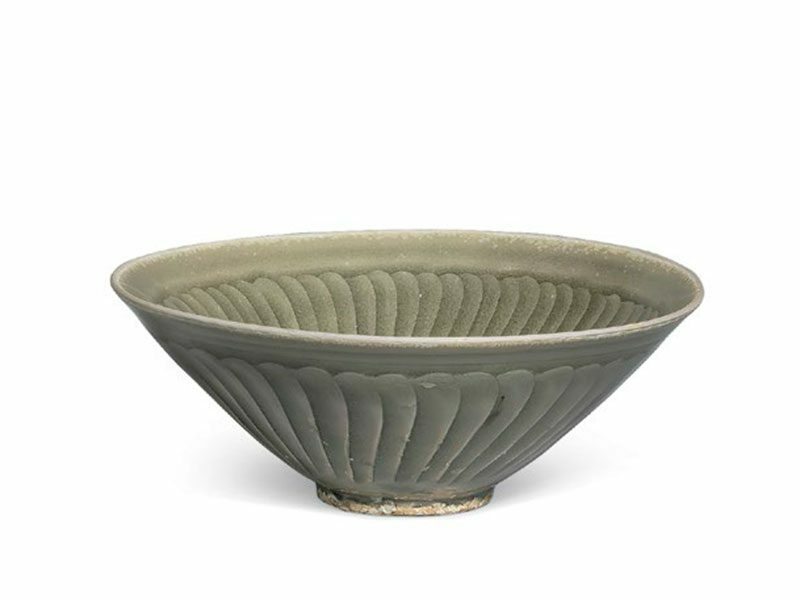 The bowl is entirely covered in a lustrous, translucent pale olive-green glaze with yellowish hue, which pools to a slightly darker colour in the recesses. Small clusters of kiln grit adhere to the base. The elegance of this stoneware bowl is expressed both in the fine, competent potting and the delicately carved chrysanthemum design. The bowl has been executed on a wheel, after which the sides were thinned down using a special tool. Chrysanthemums (ju) are known as the ‘gentleman of flowers’ and symbolise intellectual accomplishments; they are also associated with the number nine and autumn, due to the fact that they begin blooming in the ninth month of the year. The Chinese fascination for green-glazed high-fired wares goes back to the introduction of the earliest glazes and in the case of yaozhou wares, continued well into the 14th century. The pale olive-green glaze with yellowish hue, an indication of an earlier piece, is celebrated for its rarity among Yaozhou wares. The yellowish hue of the glaze is due to a reducing atmosphere in the wood-fuelled kiln, which gradually disappeared when the kilns switched from wood to coal. 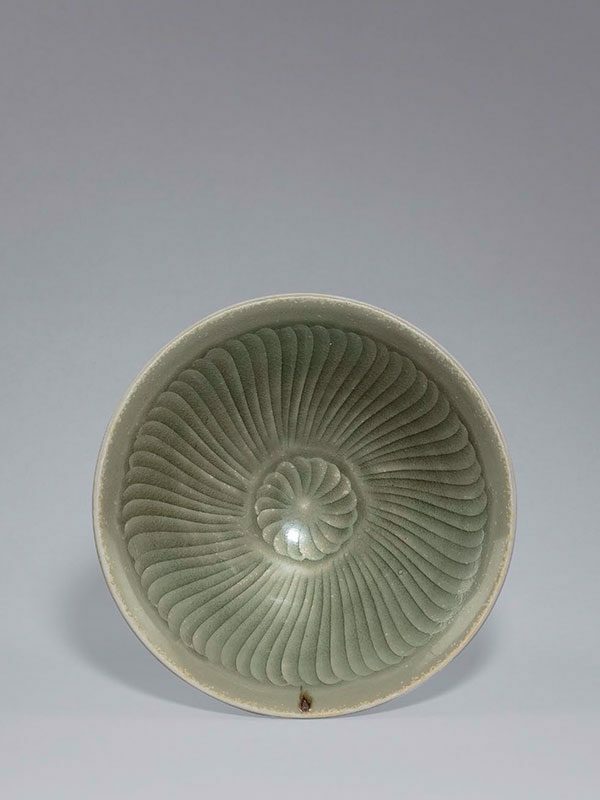 An almost identical celadon Yaozhou bowl with a closely comparable chrysanthemum design and colour of the glaze, dated to the Northern Song dynasty, is in the collection of the Palace Museum, Beijing (fig. 1). Another closely comparable example, restored with gold (kintsugi, ‘golden joinery’ technique), is in the collection of the Victoria and Albert Museum.